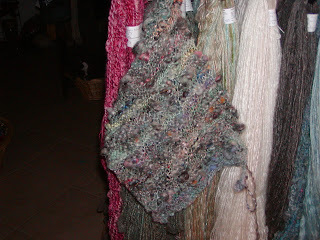 I spun the thick and thin yarn above and thought it looked kind of ratty to try to sell, so I decided to knit it up. The piece of fabric below is the result. I used a size 11 needle and cast on 31 stitches. 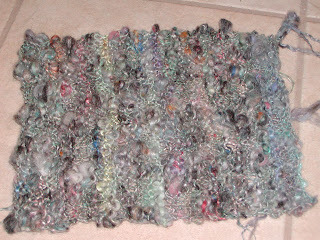 It was 60 yardsof yarn, so now I have an idea of how much yarn it would take to make a vest. Too bad, I could not tell how well it would turn out. 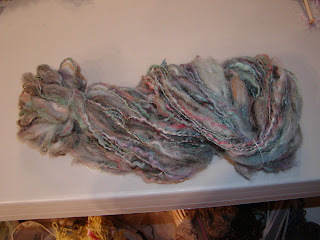 I only had the one batt, and I could have taken several other batts and spun bits and pieces to create enough to make something. I plan to spin up thick and thin to sell in hopes that there are some adventuresome knitters out there willing to experiment!